Years spent in production, false starts (director George Sidney dropped out), and lavish numbers shot, then jettisoned, leaving us to wonder if maybe the discarded stuff was better than what's here. 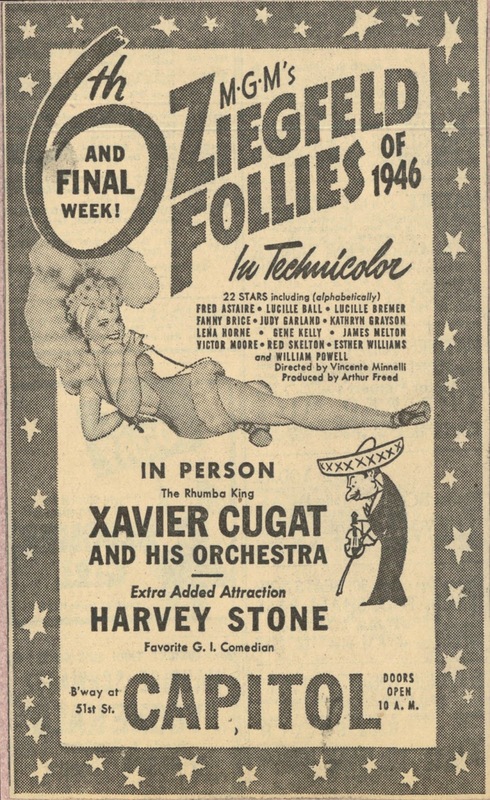 Were the actual Follies in 20's heyday as uneven as MGM's recreation? There's no narrative --- just songs and blackouts --- and get ready for a slog ... for 110 minutes. Everyone's in it who could dance/sing. Producer Arthur Freed had carte blanche after smash that was Meet Me In St. Louis, but that one had story and heart. Ziegfeld is just elephantine. Imagine $3.4 million spent, which wouldn't be got back even in movies' brightest boxoffice year and $5.3 million in worldwide rentals. MGM had a reputation to uphold: they were filmic equivalent to B'way legend Ziegfeld after all, so every musical, especially ones from the Freed unit, had to be events. A lot of Ziegfeld Follies is good; Vincente Minnelli directed the most ambitious parts, but who needed Keenan Wynn in extended comic mode, or Edward Arnold and Victor Moore in an agonizing routine with no apparent end? Comedians Ziegfeld had used were surely funnier than these, but wait, there's Fanny Brice, who did appear for the Great Man, her material as lame as the rest purporting to be funny. 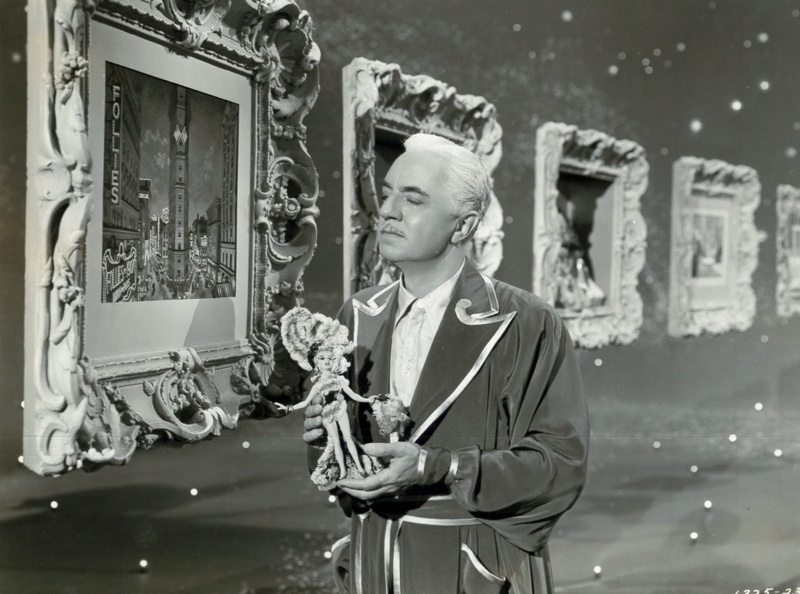 To Ziegfeld participation, there is William Powell as grey eminence in a heavenly penthouse, an opener section that shows what Metro decorators anticipated by way of eternal reward. Numerous directors handled stuff not worthy of Minnelli: Roy Del Ruth, aforementioned George Sidney, Norman Taurog. 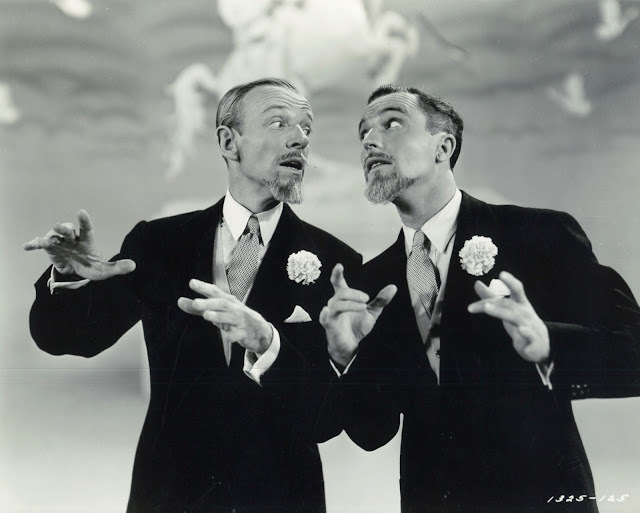 Fred Astaire dances the most, once with Gene Kelly, which, along with a Judy Garland piece, is likeliest to turn up today and in future as excerpts, along with Lucille Ball wielding a whip over chorines in cat suits. Ziegfeld Follies has played on Warner Instant in HD, and you can add a star or two to ratings previously given just for visual uptick. I remember reading about this movie for awhile until I was finally able to see it for the first time around 30 years ago. But it was quite a big disappointing endurance test to sit to watch this show since I kept trying not to constantly fall asleep over and over again (it was probably among first times that this happened to me watching a movie, the other occasions at that time were the Einsestein's soviet films that still put me to sleep). The exceptions were only a few and one of them was the sequence shared by Fred Astaire and Gene Kelly. Always thought one of the big motivations behind ZIEGFIELD FOLLIES was to give Astaire something flashy to do while the front office tried to dope out how to use him in solo vehicles. Metro had signed him around '44 but seemed a little shaky on what a Fred Astaire first-name-above-the-credits movie should look like. The comedy skits are, indeed, fascinatingly ghastly. Was anyone even at the studio screenings laughing at this crap? And for this, they left Durante on the cutting room floor? They did their best to kill Skelton's bit, staging it cold and sterile, but at least it resembles something that played well in front of a live audience once. But MGM was MGM, a studio that had already walked on a thousand punchlines. Should have farmed out the funny stuff to a more capable lot: Paramount could have given us a solid ten minutes of Bing and Bob, then Universal might insert one bit with Bud and Lou. Better still, Leo could have confined things to the musical numbers then let Columbia's short subject department fill in the cracks! 'The Babbitt And The Bromide' is wonderful. The other segments range from OK to horrible. MGM was the elephants graveyard of screen comedy. They had just about finished trashing the Marx Brothers career when this was made and Laurel and Hardy were gasping their last for Leo. The high point for me is Louis Bunin's puppets at the start. Wow. I couldn't get over the hate for this picture. I loved it. But then I realized I had the wrong picture (they both starred William Powell). I was actually remembering "The Great Ziegfeld" which itself is long and no masterpiece. Still, that number with the jillions of dancers and showgirls and the revolving (cake?) stage is worth the price of admission. Admit it, MGM - the only reason you so long on this picture is that no one could figure out how to make a whole movie that revolves around Lucille Ball with a whip. The Wynn and Arnold/Moore bits were used a decade later - with a laugh track added - as segments on MGM's compilation TV series MGM PARADE, which TCM runs frequently during the overnight hours. When Fred Astaire died I recall reading that he had declared Gene Kelly his favorite dancing partner, apparently so he wouldn't risk offending his numerous female partners. It is one of the first movie classics I saw on tv as a child and at every age I have re-watched it and I always find something new to appreciate (i.e. Tony Duquette's designs for This Heart Of Mine; the film's incredible orchestrations)! However I do have to say even as a kid the Edward Arnold-Victor Moore segment was torture; I can't help thinking how bad could Jimmy Durante's TWO segments have been that both were deleted? I always hope that someday MGM's original version - which did preview and play in some cities in 1944 and lasted almost 3 hours long - turns up in some vault somewhere. How I would love to see the spectacularly filmed Fred Astaire number in "If Swing Goes I Go Too" which was cut because of wartime references, and well, swing did sort of go away. Plus a non-singing Lena Horne serenaded as "Liza" by Avon Long, one of Broadway's early Sportin'Life in Porgy And Bess. Miraculously, the original, COMPLETE Lou Bunin Puppet Sequence - almost 8 minutes in length - survives in its entirety and sits barely watched on youtube right now. Some of those (sadly faded) cut moments are truly fascinating to contemplate in 2016. There was a puppet version of Bert Williams included in the Will Rogers, Fanny Brice, Marilyn Miller and Eddie Cantor(in puppet blackface yet) sequence but Bert was disturbingly removed from the released film. However they also deleted auditioning girls on stage transformed into lavishly costumed Ziegfeld Girls. Still, the talking Leo - designed very much like the Pink Panther, IMO, deserved to go. What remains is still enjoyable to me. I love Kathryn Grayson's There's Beauty Everywhere, Lena's LOVE, Judy's Madame Crematon and the INCREDIBLE dance numbers with Fred and Lucille Bremer - This Heart of Mine (with the Tony Duquette designs) and Limehouse Blues! Stinky is in no rush to see this one. As the presumed "headliner", Fred Astaire is pretty much the whole show. Personally, I feel all his numbers match his usual high standards, even if he is teamed with the underwhelming Lucille Bremer. To me, she ranks with Franchot Tone or Ginny Simms as MGM stars who were getting the big push from somebody, but just couldn't bring it home. As for the comedy scenes, I like Leonard Maltin's take on GUZZLER'S GIN (the simplistic no-frills staging avoids the over-production that marred many a comedy scene). PAY THE TWO DOLLARS may be a classic sketch, and I think Edward Arnold and Victor Moore are well-cast, but the premise is unrelieved frustration, with no payoff for the underdog, and that's never appealed to me. NUMBER, PLEASE was so much funnier when Abbott and Costello did it. (I'm not a big Keenan Wynn fan). The Fanny Brice sketch is on the level of a great Vitaphone short (and I mean that as a compliment - it's really funny). The story I've heard is that MADAME CREMATON was meant for Greer Garson. It's exactly the type of number meant for any dramatic actress, as it's intended to be a change of pace. To me, this was an almost tragic waste of Judy Garland. She deserved a great big song and dance number, not someone's leftovers. Sorry to see so many people unenthusiastic about "Ziegfeld Follies". As a lifetime fan of MGM musicals - especially Minnelli ones, I've always considered it an especially glorious wallow. With the Freed unit entering their greatest period in a blast of talent and Technicolor. Except for the Guzzler's Gin routine, I even find the comedy skits reasonably funny. Yes, Keenan Wynn was all too inescapable a presence in Metro films of the era - but I think with "Number Please" he at least had some amusingly written material to work with. No problems for me with the Moore and Brice items, either. I chuckled at both. It's the musical numbers, though that really define and elevate the "Ziegfeld Follies" experience. That fabulous Minnelli visual design is everywhere - sets, costumes,heady ambience. To me it's catnip. And - in my books - Esther Williams and Kathryn Grayson are always welcome. When Grayson wanders through that Dali meets Soap-Suds Heaven finale, she sounds great and looks extra-beautiful - like Disney's Snow White come to life. Probably the only number that underwhelmed me was the rather low impact Astaire/Kelly duet. Of course I love and admire both these guys. But - because of that I probably expected something beyond exceptional from such a once in a lifetime teaming. I think I read in songwriter Hugh Martin's autobiography, "The Boy Next Door" that a different song had been initially scheduled for the Astaire-Kelly summit. Wish I could remember the name of it. Seems to me it was something far more promising and tuneful than that dreary "Babbitt and the Bromide" thing. Anyway, it seems Astaire was - for whatever reason - keen on using the "Babbitt" song. And Kelly respectfully deferred to him. As for Astaire's two numbers with Lucille Bremer, "This Heart of Mine" and "Limehouse Blues", I think they're both stupendous. Absolute pinnacle moments for the MGM musical, for Astaire, Minnelli - and - yes - for Lucille Bremer too. Whatever her perceived shortcomings as a dramatic actress, on a dance floor she was grace itself - breathtaking. Certainly one of Astaire's best ever dance partners. Can't wait to dive into those glorious numbers again when this movie finally comes out(soon I hope)in Blu-ray. 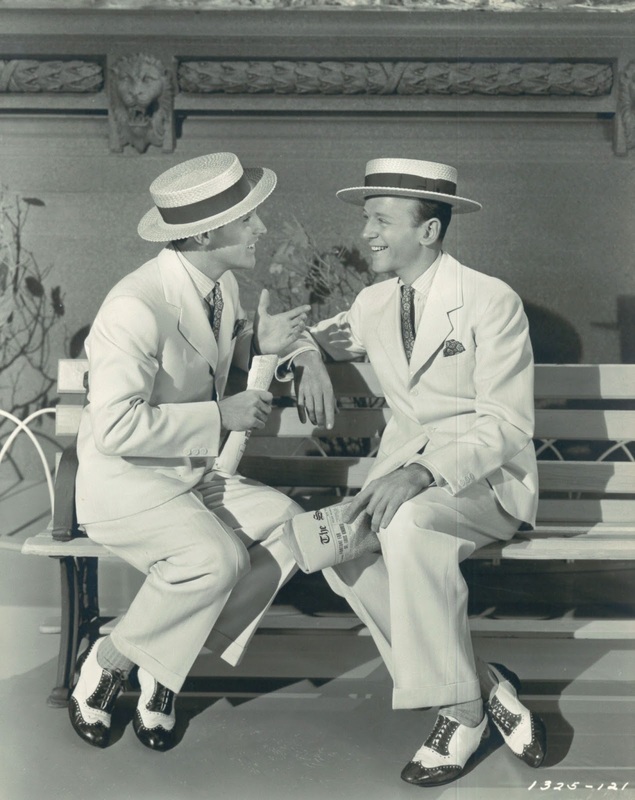 The song originally intended for the Astaire-Kelly duet was "Pass That Peace Pipe", so memorably done by Joan McCracken and cast in 'Good News' the following year. Thanks, Mr. K, for the welcome reminder about "Pass That Peace Pipe". I've always loved that song. And you're right - Joan McCracken, Ray McDonald and the MGM team really do sell the number in "Good News". Ms McCracken was very pretty, charismatic, funny and a great dancer. But her singing voice was never her strong suit. Don't get me wrong. I'm glad she got to shine in an MGM musical - and she's good throughout it. But every time I watch the number I can't help wishing there were an alternate version where McCracken lookalike Dona Drake had that role. Drake was a talent powerhouse - great looking, a comic firecracker, super-energized dancer and on top of all that a marvelous singer. Always within an inch of that big break that would have propelled her to major league movie musical stardom. It would have been lots of fun to watch her pass that peace pipe. Is Stinky the only one who finds animated puppets slightly creepy? The upright, dressed Leo was used in MGM trade marketing, albeit with a different design, along with a Little Leo cub for short subjects. There was also an animated trailer for the 1952 Scaramouche that featured a Leo-type standing in for Stewart Granger -- because no actual footage was ready? I assume it was the work of the MGM animated shorts department. Didn't find on YouTube but it was an extra on the DVD. The finale of this film reminds me of the number in The Band Wagon with fire, demons, brimstone, moving sets, smoke, explosions, etc...and the cast finally all looking at each other like "what the heck are we doing?". Girls jumping through piles of soap suds on a Dali-esque soundstage. Not one of MGM's finest moments. The "Guzzler's Gin" skit was the likely inspiration for the "Vitameatavegamin" episode of "I Love Lucy." Why didn't MGM just make an all-star like Warner's HOLLYWOOD CANTEEN or Andrew Stone's other CANTEEN movie? Oops, they DID-THOUSANDS CHEER!-But they HELD MOST OF THE STARS AT BAY UNTIL THE LAST REEL!